Posts tagged "roasted smashed potatoes"
Do you all ever get in a dinner rut? I do! It seems like we eat the same thing over and over. I try to look for new things to make, and when I do sometimes the family loves it: Potato soup, and sometimes they don’t: yellow tomato pasta. To be honest I ended up tossing part of the pasta after everyone refused to eat it for leftovers. 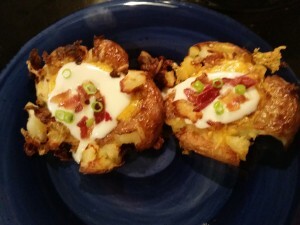 So I was really excited when I saw this recipe on my friend Pam’s Facebook wall. I saw it during one of those times I was browsing Facebook, aka “the time sucking website”, and this popped up! It looked intriguing, and I decided to give it a try. I wasn’t sure when I would make them, but the other day when Karol suggested she make her famous ribs for dinner, I thought, this would be a perfect side dish! To be honest I adore potatoes. Nothing soothes my soul quite like mashed potatoes, with or without gravy. 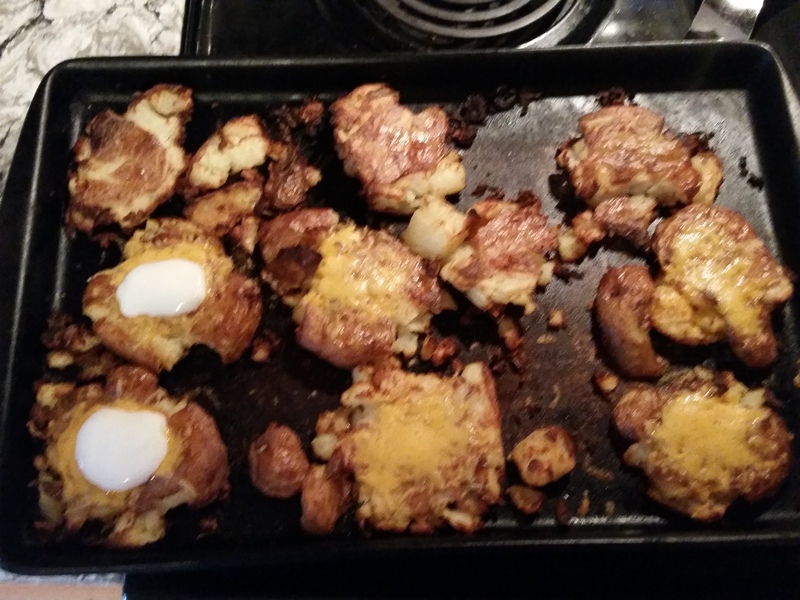 However, potatoes really aren’t very good for me, so I limit my intake of them. So when I find a recipe that uses just three ingredients and I can soothe my soul without the added calories of butter and milk, I am in! Now just to be perfectly honest, I did make some of these “loaded” and added shredded cheese, a dollop of sour cream, crumbled bacon and scallions, but they are just as good plain! Preheat the oven to 450 degrees F. Adjust the oven racks to the top position. Boil the potatoes in water for 10-15 minutes or until fork tender. Place on a prepared baking sheet. Some recipes tell you to smash them with a potato peeler, or between two kitchen towels. I used the bottom of a drinking glass. Worked great!! 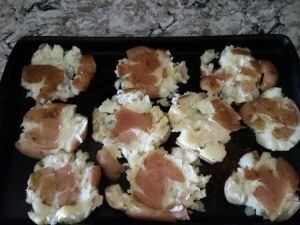 Place the smashed potatoes on the baking sheet and drizzle with olive oil, salt and pepper. Roast the potatoes on the top rack for about 20-30 minutes, turning them over gently with a spatula 1/2 way through the cooking time, so about 10-15 minutes. 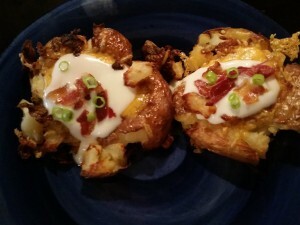 Top with cheese, or any baked potato item you love. Or just eat them plain. 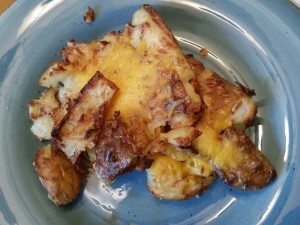 My favorite part were the crunchy bits, and my kids devoured them! They are even good reheated, although not so crunchy. Out of the oven. Cheese on some, sour cream on two. ready to go in my mouth!!! Super easy and delicious side dish that can be made in about 45 minutes, but require very little time in the way of “making” them. Most of the time is spent boiling and baking, so you can get other things done at the same time!